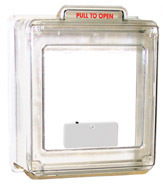 SPECIFICATIONS: Protective covers, as supplied by National Fire Equipment Ltd., with body and hinged cover injection molded of high-density red polyethylene with optimum impact and tensile strengths and appropriate elongation and flex modulus and Underwriters' Laboratories HB94 burn rating, unless other color specified, glass panel with appropriate silk screen message on inside of panel. If model with breaker bar is specified, the bar is galvanized steel attached to cover with steel cable. Covers with pull handles designed to A.D.A. specifications. National Fire's protective covers with unsecured covers and without breaker bar are furnished in integrally molded one-piece copolymer cover, eliminating problems encountered with glass panels.